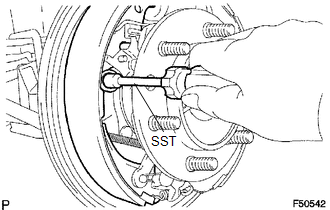 (a) Using SST, remove the shoe return spring from the front brake shoe. (b) Using needle-nose pliers, remove the return spring. (c) Using SST, remove the shoe hold down spring cup, shoe hold down spring and pin. (d) Remove the parking brake shoe strut lower. 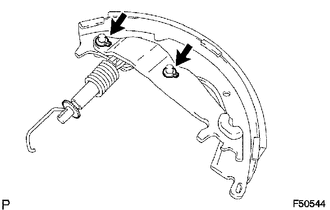 (e) Remove the tension spring and front brake shoe. 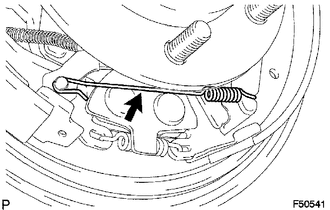 (f) Remove the automatic adjust lever spring and automatic adjust lever LH from the front brake shoe. 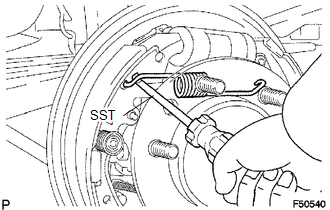 (a) Using SST, remove the shoe hold down spring cup, shoe hold down spring and pin. 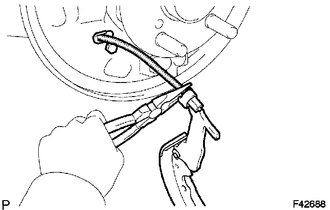 (b) Using needle-nose pliers, disconnect the parking brake cable No. 3 and remove the rear brake shoe. (c) Using a screwdriver, remove the 2 C-washers, parking brake shoe lever, parking brake reaction lever and parking brake shoe strut set. 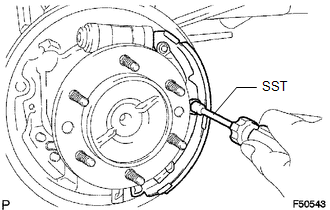 (a) Using a union nut wrench, disconnect the brake tube, and use a container to collect the brake fluid as it flows out. (b) Remove the 2 bolts and rear wheel brake cylinder assembly. (a) Remove the 2 wheel cylinder boots from the rear wheel brake cylinder. (b) Remove the 2 pistons and compression spring. (c) Remove the 2 cylinder cups from each piston. 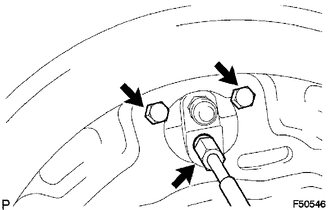 (d) Remove the bleeder plug cap and bleeder plug from the rear wheel brake cylinder.